Here are our best tips for a US Virgin Islands vacation! The wonderful US Virgin Islands, an incorporated United States territory, has to offer more than just a regular Caribbean getaway. With the islands' consistent weather throughout the year, unbelievably white sands, picturesque beaches with bright turquoise waters, luxury resorts, and mind blowing activities, this paradise will leave a firm footprint in your heart and in your photo album! The most popular vacation spot in the US Virgin Islands is St. Thomas, then goes more laid-back St. John, and the more secluded St.Croix. 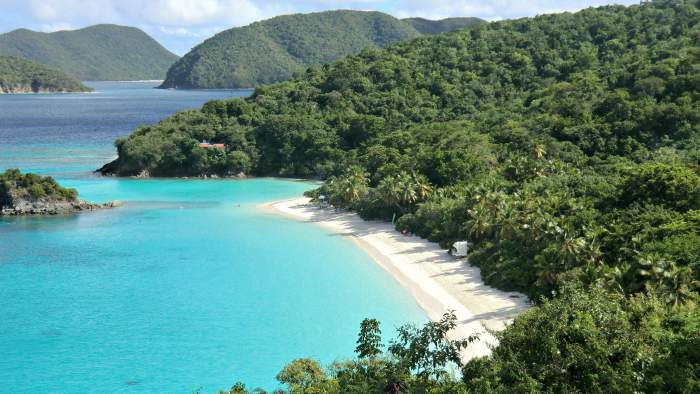 Why vacation in the US Virgin Islands? Vacationing in the US Virgin Islands is a true delight, because you get to experience the beauty of the entire island in just one trip. Aside from a variety of water sports activities such as snorkeling, scuba diving, and kayaking, the island offers the best historical sites, the top attractions, and the reggae rhythms tossed along the streets of Charlotte Amalie on St. Thomas. St. Thomas, the largest island in this Caribbean retreat, has something for everyone, from dazzling golf courses, to historic museums and galleries, to oldest Forts and Harbours and stunning panoramic views that can be admired while hiking, walking and biking tours. No matter what your passion is, you will always find something fun to do on your US Virgin Islands vacation. 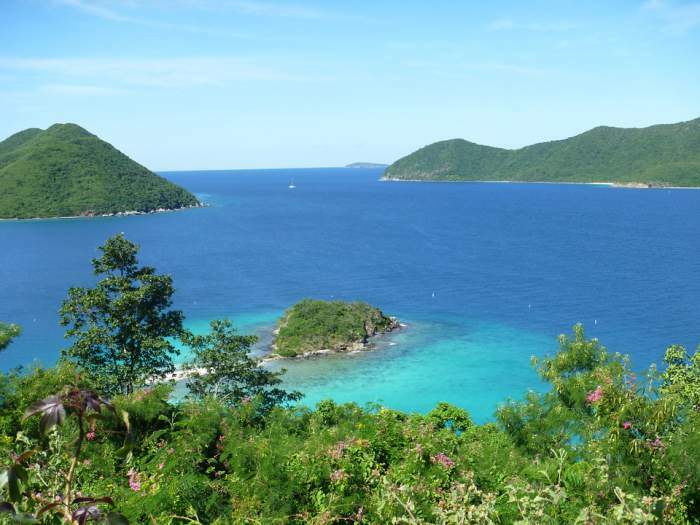 If you chose to vacation in St. John, visit the Maho Bay that draws in visitors thanks to its shallow and calm waters. For some marine experience, stop at the Coral World Ocean Park, or pay a visit to the unique Butterfly Garden and Annaberg Sugar Plantation. Fort Christian, the older standing structure in UVI is a popular point of interest among the visitors as well. Dive into the history and check out the Haagensen House, Seven Arches Museum and Gallery or Saint Peter and Paul Cathedral. All that and more carry their own story, ready to be shared with its visitors. St. Croix, the more remote island, has its own history. It is less reliant on tourism than St. Thomas and St. John, but there are numerous secluded beaches here, an array of fine dinning establishments. Shopping is another great reason you should go to the US Virgin Islands on vacation, where sale deals are as much as 60% off regular US price tags. Along with amazing high-end stores, exclusive merchandise and great prices, all of your purchases are exempt from taxes. So you will be fully indulging in the world of shopping without worrying of spending too much. What's even more appealing is that you may even send gifts to your friends and family, but no more than one package per day totalling $100 or less. Keep in mind, you would not need to declare it, but will be required to fill out a customs form. Keep the receipt, just to prove that you have paid in full. Just like other Caribbean vacation spots, the US Virgin Island experiences peak tourist season December through March. So if you are going on the US Virgin Island vacation during this time, expect large crowds, whopping accommodation rates and extensive line-ups and long wait times. The weather during this high season gets to 27 degrees Celsius (80 degrees Fahrenheit) at the most, and to keep yourself warm in the early mornings and evenings, pack a pair of pants and a jacket. The best time to visit the US Virgin islands is from April to June. Many tourists have already gone home, accommodation rates drop as much as 50% depending on the resort and the weather is beautiful at mid 20s-30s degrees Celsius (mid 70s to high 80s degrees Fahrenheit) with little chances of precipitation. If you decide to visit during this time, you might want to join in on UVI's biggest Carnival of the year - St. Thomas Carnival, that takes places in the capital Charlotte Amalie. Many people gather in for the island's largest celebration with costumes, dancing, music and mouthwatering local delicacies. For those on a strict budget, July to November will offer you even greater discounts during your US Virgin Islands vacation on everything including lodging, car rental, guided tours, activities and even dining. However, keep in mind, hurricane season is at its peak point, and although a bad storm is a seldom occurrence, you will have plenty of rain with very hot and humid weather anywhere from 29-32 degrees Celsius (85-90 degrees Fahrenheit). Where are the US Virgin Islands on the map? Discover America's own slice of the Caribbean when you step on the soil of the US Virgin Islands. The total area of this tropical jewel is 345 square km (133 square miles). It lays 179 km (112 miles) east of Puerto Rico and 1,780 km (1,106 miles) southeast of Miami, Florida. 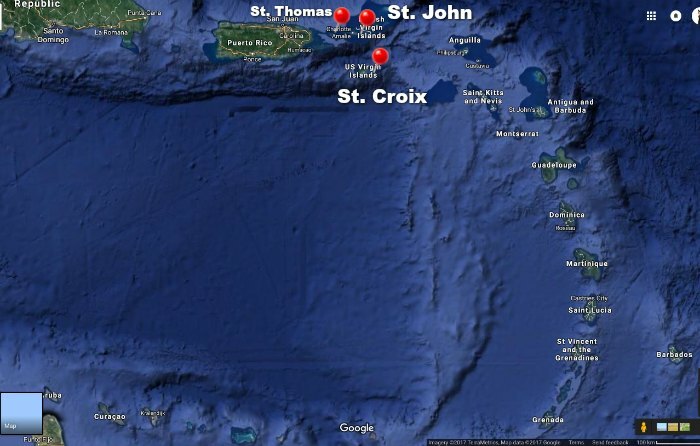 The two US Virgin Islands - St. John and St. Thomas, are located closer to the British Virgin Islands, than to their sister US Virgin Island - St. Croix. The US Virgin Islands consist of 4 major and quite distinctive islands and around 50 smaller islets and cays, so there is a lot to uncover once you land here. St. Thomas, St. Croix and St. John are the main inhabited UVI's gems, all different in their own ways that are surrounded by ancient coral reefs. Charlotte Amalie, the capital as well as the largest city in the US Virgin Islands is a perfect jumping-off point for exploring all the beautiful nature and the wonders of St. Thomas. Cruise ships are anchored at the harbour with thousands of passengers walking along the streets of Charlotte Amalie. Aside from pricey but exquisite shops, the bustling crowds and the Caribbean vibe, the capital of the US Virgin Islands has the most captivating history and the most engaging activities like you have never experienced before. Charlotte Amalie is located on the southern edge of the island of St. Thomas and has an estimated population at 19,000 in 2016. Whether you are stepping off the cruise ship, passing by St. Thomas or staying here for your US Virgin Islands vacation, there are a number of points of interest you could see and a variety of water and land activities to do. Emancipation Gardens are an ideal place to start your walking tour. 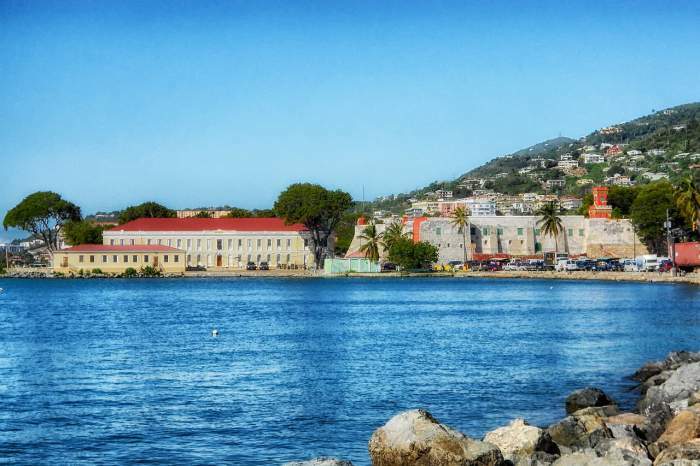 Fort Christian, the US National Landmark and St. Thomas's oldest standing structure was used as a jail, the governor's residence, town hall, courthouse and even a Church, is a must-visit attraction! Blackbeard's castle, a high defensive tower that was build to protect the Fort from the outside attacks is now reopened to the public with self-guided tours. Hassel Island is another attraction close to the capital of the US Virgin Islands. Long ago it was part of a peninsula, but later the government has decided to separate it from St. Thomas for it to become a separate island. This island is best explored by either kayaking, snorkeling or even hiking, and for better experience top it up with a history lesson by a professional tour guide. Get close to the locally grown animals and visit the Secret Harbour. There you will spot more iguanas than tourists, and despite the large number of cruise ship passengers, the beaches here are quiet and peaceful, perfect for snorkeling while a few squids swim by you. Magens Bay is another fascinating landmark of Charlotte Amalie. 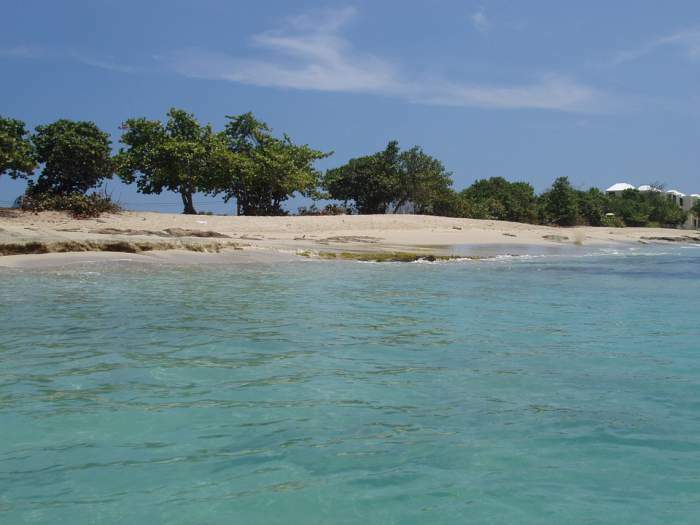 It is a one of a kind beach curved in a way of an arc with bright white sand and crystal clear blue water. It's a great family outing while on US Virgin Islands vacation, perfect for splashing in the sun, kayaking and tanning, while the calm waves hit at the shores. Put your hesitation aside and experience a whole new world of divine beauty, breathtaking history and roller-coaster adventures, when you visit the great capital of the US Virgin Islands, Charlotte Amalie. According to national statistics, the total population of the US Virgin Islands in 2016 is 106,475. St. Thomas, the most developed out of all islands has approximately 51,452 residents, St. Croix, the more quiet and secluded island has 50,601 people and St. John ,the third largest island in the US Virgin Islands, has only 4,170 residents. Most of the US Virgin Islands population consists of residents of African-Caribbean decent, however, other races including Caucasian and American Indian make up the most of the nation's population numbers. Christianity is the dominant religion in the US Virgin Islands, Protestantism and Roman Catholicism prevale here, making up almost 60% and 34% of the population respectively. Virgin Islanders are well-mannered and very polite. It's considered good manners if you meet someone with a "good morning, afternoon, or night", before starting the actual conversation. It is rude if you do not greet someone before engaging in your talk further, so always keep in mind that friendliness and tactfulness will take you a long way on your US Virgin Islands vacation. Locals dress casually, but beach wear is not acceptable in public places other than the beach, so if you are planning on visiting a nearby restaurant or a cafe, wear something appropriate. The official language in US Virgin Islands is English. It is widely spoken across the islands, taught in schools and is the language of instruction in all government, business, media, education and medical operations. English is pronounced with a very unique local accent, and often spoken rapidly. It might be uncommon for a foreign traveller to understand everything at once, so if you think you are losing what the speaker is saying just ask them to repeat it to you. Although Spanish is not the language of speech on the islands, there is a high concentration of immigrants from Puerto Rico and Dominican Republic, specifically on St. Thomas and St. Croix. So if you possess some Spanish skills and are staying on one of these islands during your US Virgin Islands vacation, rest assured you will be able to use both English and Spanish to communicate. French Creole is a colourful dialect that is fairly common in UVI, and is spoken by immigrants from St. Lucia, Haiti, Martinique, St. Martin, Dominica, French Guyana and Guadeloupe. It involves a completely different pronunciation, has a distinctive vocabulary and its own grammatical rules. These folks speak French Creole among themselves only, while speaking the island's official language to tourists and other local residents that do not communicate in this form of a dialect. The Cyril E. King International Airport located about 6 km (4 miles) east of the capital of St. Thomas welcomes aircrafts of all sizes, both, international and domestic flights. It is considered to be one of the busiest airports in the Caribbean being on call 24 hours a day 7 days a week; however, the terminal itself is opened from 6:00 a.m. to 11:00 p.m. only. US citizens get a real treat when travelling on the US Virgin Islands vacation - a passport is not required to go through customs to enter the island. There are a number of nonstop flights available from the United States to St. Thomas, which can be reached from Boston, Atlanta, Charlotte, Chicago, Fort Lauderdale, Miami, New York, Philadelphia or Washington. Europe and Canada (Toronto and Montreal) do not offer nonstop flights to the US Virgin Islands ; therefore, passengers must make their transit stops in one of the US cities. Other connecting flights are also available from Los Angeles, Dallas, New York, Miami and Atlanta, but keep in mind it is via the San Juan hub only. Tourists visiting St. Croix must know that Miami is the only destination that offers nonstop flights to this island. Those travelling from Europe, Canada or other major cities in the United States, must catch their connecting flights to St. Croix either in Miami, San Juan or St. Thomas. There are no flights to St. John as this island does not have its own airport. If St. John is your final destination, you would need to fly to St. Thomas first, take a quick taxi ride to one of the local inter-island ferry docks either in Red Hook or Charlotte Amalie, and get to the island of St. John by water. Henry E. Rohlsen Airport is located approximately 10 km (6 miles) southwest of Christiansted on the island of St. Croix. It is proudly served by two major domestic carriers and also welcomes daily inter-island flights. If you wish to go island hopping and explore the US Virgin Islands by water, ferries are always available at your convenience to take you from St. Thomas to St. John. But since St. Croix is farther removed, and the ferry service to this island is not available, a quick flight from St. Thomas will get you here in no time for your US Virgin Islands vacation. An abundance of accommodation options are available on the US Virgin Islands and no matter where you go, you will always find something in accordance with your taste and budget. 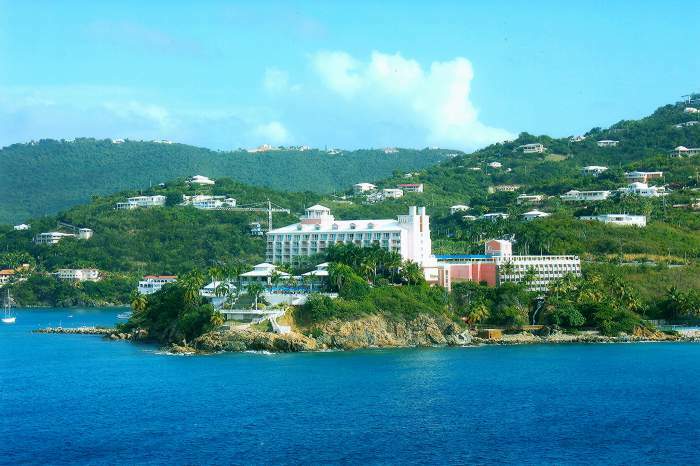 St. Thomas, the most developed out of all three islands, provides its visitors the most out of lodgings opportunities. Its fun and vibrant look and feel gives you deluxe shopping and a number of activities and things to do, suitable for any guest. There a few all-inclusive resort on St. Thomas, and the choice is endless with other big luxury US Virgin Islands vacation properties with top of the line dining options, first class shopping and a string of adventures and activities. Carefully check exactly what the hotel/resort you are planning to stay at offers and what perks are included in the price before booking. Small, but super cozy inns and large villas are also available for booking, but if you long for seclusion during your US Virgin Islands vacation, your best bet would be to stay either on St. John or St. Croix. St. John is the least developed out of all the islands in the UVI and offers only 2 big upscale resorts while the rest of the accommodations are small properties and villas. There are no all-inclusive resorts; however, some of those that are available provide meal plans at extra surcharge. St. John is the perfect spot if you want a small-island feel without the dynamics of a busy Caribbean life. A range of villas and small inns are available for guests looking for a quiet getaway; however, most of them are not beachfront properties, so expect a little bit of distance before you get to enjoy the lukewarm Caribbean water. St. Croix is the largest out of all islands, but a very peaceful spot that enjoys a stunning scenery, simple inns and exquisite midsize resorts, so if you are confident of staying in a relaxed, quiet place not too close to the beach, this island is just for you. There is only one all-inclusive resort, one resort with breakfast included daily and other resorts offering a variety of dining options, inside and outside resort activities and a full range of resort amenities. Beaches in St. Croix are not as breathtaking as on the other two islands, but the views are still majestic, perfect for romantic sunsets or enjoying a walk along the beautiful endless coastlines on your US Virgin Islands vacation. High season in the US Virgin Islands is similar to those in other Caribbean islands and runs from mid December through mid April. There are no significant seasonal changes on the islands, so the weather stays somewhat consistent all year long. The hottest months are June, July and August, and the temperatures during these months stay in the mid 20s degrees Celsius (mid of 80s degrees Fahrenheit). Water, being is at 28 degrees Celsius (83 degrees Fahrenheit) is unrealistically hot and great for the kids and adults to enjoy. December through February is a cooler period with numbers in the lower 20s degrees Celsius (high 70s degrees Fahrenheit). January through June the temperatures stay anywhere between 29-32 degrees Celsius (85-89 degrees Fahrenheit) with the water being pleasantly warm at 26 degrees Celsius (79 degrees Fahrenheit). Although, rainfall is not a frequent occurrence in the US Virgin Islands, May, August, September, October and November are the months that experience the most precipitation. However, it should not prevent you from having your perfect US Virgin Islands vacation during this time as most rains happen in the early morning or late evening hours. Hurricane season is a tropical cyclone that affects some Caribbean islands. And although chances of a hurricane affecting the US Virgin Islands are small, you should still be prepared for a storm anytime from June 1 to November 30. While US Virgin Islands is not recommended for hitchhiking or walking by foot, the public transportation here is a great way to go around the islands during your US Virgin Islands vacation. Sometimes public buses are not a very reliable method of transportation here, and if you are on a tight schedule, consider hiring a taxi instead as the wait times could take up a chunk of your time. Fares are super affordable and the buses run from early mornings to late evenings. The whole bus system is called VITRAN, that has black and orange vehicles and the bus stops are marked with "VITRAN" signs. The taxis are in abundance and although it is not a very reasonably priced method of transportation, it is sure the most reliable and efficient. If you are planning on visiting multiple destinations, then renting a car is much more economical to move around the islands. There are no metered taxis, and the fares depend on the number of passengers and their destinations. Did you know that the US Virgin islands even offer "Dollar Taxis"? These open-air safari buses are operated by regular taxi drivers are not regulated by the government and do not have any identification signs. They pull up close to bus stops and run on the same routes as public buses. Keep in mind, not all safari buses run as "dollar taxis", as some of them operate as regular taxis. To avoid confusion and possible extra charges for your trip, before boarding, ask the driver if his bus is being operated as the "dollar taxi", and which route he is following. The fees are obviously cheap, the name speaks for itself, but if you are not the local resident, the driver might charge you regular taxi prices, keep that in mind. Renting out a bike to travel through the US Virgin Islands on your vacation is a great idea, but only if you stick with the locally offered biking tours. It is not advised to go biking without a group of people and a tour guide, as the roads here are hilly, with potholes, bumps and it might get quite dangerous on the roads. To get a real taste of this biking experience, sign up with one of the local mountain bike excursions and have fun! Driving in the US Virgin Islands is a real pleasure, and although the mainland is made of terrain, the roads are in great and paved condition. Hiring a taxi is also an option, but it can turn out to be quite expensive, so if you feel comfortable travelling through the islands solo without the need of a tour guide or a chauffeur, rent a vehicle and be on your way of exploring. Driving in the US Virgin Islands is on the left, British style, and the law requires everyone to wear a seatbelt at all times. You will find that heavy traffic can arise during the rush hours, but it slows down by 9 a.m. and 7:00 p.m. subsequently. Car rental agencies are available at your service on all three islands, St. Thomas, St. John and St. Croix, and if you are situated far from them the agencies, a car will be delivered to you directly. Drivers that possess American driver's licenses will be able to operate a vehicle on the islands for up to 90 days. Foreigners will need to purchase a temporary permit in order to be able to rent a car. Speed limits are usually 35 mph (55 kph) outside of town and 20 mph (32 kph) in town, but please be extra cautious on the roads, as not everyone might follow the road rules. If you are thinking of doing island hopping on your US Virgin Islands vacation, a ferry boat is available to transport cars from Red Hook, St. Thomas and Cruz Bay, St. John, so you may explore the islands at your own pace, time and in the comfort of your car. Scooters is another possible option to take to explore the islands, but only if you are a risk taker. Although this type of transportation rental is available to all the tourists, it is not recommended for hiring as the accidents are frequent and sometimes fatal. The official currency in US Virgin Islands is the US dollar. It is widely used across the islands in all hotels, resorts, restaurants and other establishments. All major credit cards are also accepted pretty much anywhere you go while you are on US Virgin islands vacation, and ATM machines are scattered throughout the country making money withdrawal transactions easily accessible. Being thoughtful and considerate is appreciated anywhere in the world, so when you arrive in the US Virgin Islands, the tipping rules are the same as pretty much anywhere in the Caribbean and the United States. Restaurants normally expect a 15% tip, and most of the time it is not included in the final bill unless you have a company of 10 or more dining. If you consider the service excellent and the attitude of the waiter friendly and attentive, you are welcome to leave more for the service staff. Bellhops and porters in the US Virgin Islands normally receive $1-$2 per bag they help you carry, the maids get $2 per day for their housekeeping service and depending on the level of assistance, concierge and valet attendants usually receive $1-$2 per each time they are at your service. Hotels and resorts normally do not add a service charge to their final invoices; however, some of them might leave an empty envelope in your hotel/resort suite for you to leave the tips in there after your US Virgin Islands vacation. Taxi drivers do not expect tips, but they would very much appreciate if you acknowledged them for their service. If they went above and beyond and acted as a tour guide, or helped you with heavy luggage, it is a proper gesture to show your gratitude and tip accordingly. Shopping enthusiasts will love strolling through local shops in the US Virgin Islands, that sell amazing jewellery pieces, a variety of eye-catching souvenirs, perfume, tobacco, cameras, crystal, china and much more. Needless to say all of your purchases are not subject to taxes, so go wild and enjoy the best shopping experience. Vendors on the island are polite, friendly and will never force their product upon you in the aggressive way. You might come across an intimidating beach vendors once in a while, and if you do and are not interested in buying, a simple and cordial "No thank you" will let you two go your separate ways. Always exercise security measures wherever you go, even in your home country. If you are staying at a hotel, a resort, a villa or just renting out a room while vacationing in the US Virgin Islands, make sure to keep the doors locked at all times. Some areas throughout the islands are safer than others, so it's best to keep yourself safe and alert everywhere you go. Do not leave your valuables in plain sight, chances of them being in the same spot where you left them are slim. As soon as you turn away, someone will always be there for a grab, so lock all of your belongings in a hotel safe or keep them in a Knapsack close to your body. If you are on your way to the beach, it's best to leave your personal property behind in your hotel suite unless you have someone to supervise it while you take a swim. For a worry-free US Virgin Islands vacation consider leaving expensive jewellery and electronics at home, it will save you nerves and hassle of always being on the lookout for thieves. It is very important not to hike or travel alone while on US Virgin Islands vacation, especially in the dark hours. Always have company with you or just stay within your resort/hotel boundaries. Remember, your vacation has to be adventurous in good and fun ways, no need to take risks and put yourself in dangerous situations. Use common sense and do not throw the caution and vigilance to the wind. Tap water in the US Virgin Islands is absolutely safe to drink, and all the hotels, resorts and villas offer their guests tasty and purified water. Any establishment on the island, who supplies water to the public is required by law to have their water tested for quality and cleanliness regularly by an independent laboratory, so rest assured, once on the island, you will be getting the best water that is safe to quench your thirst. An option of buying bottled water is always available to those who are concerned about immunity to foreign tap water or have a sensitive stomach. Either way, bottled water comes in handy when you travel outside your resort, go to the beach or go on trips and excursions. It is always important to stay hydrated throughout the day. Electrical outlets in the US Virgin Islands are the same as in Canada and the US, being at 110-120 volts with a frequency of 60 cycles, so travellers coming from these countries do not need any adaptors or voltage converters. Tourists from Europe, where electricity is at 240 volts, will definitely require a voltage converter or transformer. It is not recommended to use your electric devices on the island if their voltage is not compatible to the local electricity. They might burn out or simply not function optimally and to your standards. If you are coming from the east part of the world, pack the chargers, converters and/or transformers in accordance with the island's voltage. Have a worry-free US Virgin Islands vacation!